The use of disposable medical sensors is continuously increasing, fueling a multibillion-dollar global industry. BCC Research predicts that this market will expand at a healthy double-digit growth rate worldwide, with the potential to reach $9 billion by 2022. An increase in geriatric populations all over the world will lead to more demand for continuous health monitoring devices for a larger number of diseases pertaining to cardiovascular, audiology and urology systems. A robust expansion from $5.1 billion in 2016 global sales will be partially due to high unmet medical needs and demand in emerging Latin American and Asian-Pacific economies. 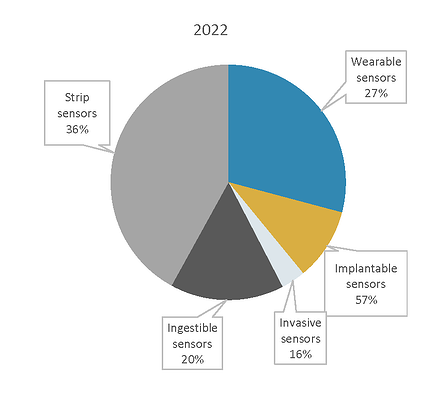 Increasing penetration of wearable technology in the medical industry—attributed to the growing prevalence of chronic diseases coupled with the trend toward shorter hospital stays—is expected to drive the demand for wearable sensors over the next five years. Don’t Like Watches? Get Some Ink. Mobile health sensors are being cleverly disguised as tattoos—traditional tattoo ink is replaced with color-changing biosensors. When affixed to the skin, the sensors react to changes in the body’s interstitial fluid and can change colors in response to biomarkers like glucose and sodium. Using a tattoo as a medical sensor could supplant those that are affixed to the skin with the encumbrances of a wristband, watch, sleeve or some other piece of clothing. The DermalAbyss project, which combines tattoos and biotech, is a collaboration between researchers at the Massachusetts Institute of Technology and Harvard Medical School. While the project is only for academic research, the possibilities are intriguing. The tattoos could potentially be used to detect blood glucose levels in diabetics, measure dehydration or certain biological changes caused by chronic conditions or allow for remote monitoring after a hospital discharge. For those who don’t want a tattoo, the ink could be rendered invisible and seen only under certain colors of light (e.g., produced by a smartphone). These smart tattoos would bypass the need for battery power and wireless connectivity. Researchers at North Carolina State University are using a $1.5 million federal grant to develop a wearable sensor that continuously monitors the amount of oxygen in surrounding tissue. The so-called smart bandage, co-developed by Profusa, is being designed to help clinicians treat patients with peripheral artery disease (PAD). “The goal of our collaboration is to develop a bandage-like version of Profusa’s first-generation optical reader that is flexible, disposable and conforms to the foot for continuous monitoring of tissue oxygen levels during revascularization and restenosis in patients with PAD,” Natalie Wisniewski, PhD, Profusa’s chief technology officer and principal investigator of the program, said in a press release. Brigham and Women’s Hospital is conducting a study to determine whether a disposable biosensor patch developed by VitalConnect can help clinicians remotely track patients with heart failure, pneumonia, COPD, cellulitis or complicated urinary tract infection while those patients are at home. Another company, MC10, has launched several patches: the BioStampRC, designed to measure biometric signals like heart rate; the WiSP, a cardiac monitoring patch; and the BioStampMD, intended to quantify treatment efficacy. According to BCC Research’s forecast, the global disposable medical sensors market is expected to grow at a five-year compound annual growth rate (CAGR) of 10%. Rising demand for diagnostic and monitoring devices, such as cardiac pacemakers and blood glucose monitors, is the key driver of the biosensors segment. 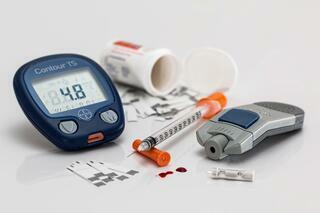 In addition, insulin and infusion pumps are increasingly used due to the high prevalence of diabetes. This and other chronic diseases are expected to drive market growth even further. On September 27, the FDA approved Abbott’s FreeStyle Libre Flash Glucose Monitoring System. A durable sensor patch the size of two stacked quarters is worn on the back of the diabetic’s arm. The disposable sensors can be used for 10 days, and the system does not require a fingerstick to obtain a blood glucose reading. The system has been approved for use in Europe since 2014. The U.S. version, which provides current glucose level, trending arrow and eight-hour glucose history in each scan, will be available by prescription before the end of the year. The initial version will include a dedicated scanner device that uses RFID and Near Field Communication protocols. However, U.S. users should soon be able to use their smartphones to read their sensors via an app called LibreLink (already available in Europe). The FreeStyle Libre system allows diabetics to continuously monitor their glucose levels without having to obtain a fingerstick blood sample. “The healthcare industry is rapidly moving toward miniaturization of equipment and use of nanotechnology for diagnostics and treatment. Moreover, in keeping with this trend, manufacturers are focusing on producing microelectromechanical systems,” said Vijay Laxmi, BCC Research analyst. “The growing demand for minimally invasive surgeries also presents a significant opportunity for disposable sensors.” A rise in hospital-acquired infections is another factor driving the disposable medical sensor market. In principle, wearable sensor technology in the hospital setting should make the jobs of healthcare personnel easier. In terms of convenience, a disposable wearable sensor is ideal—it is applied to the patient, paired to a relay device and disposed of when no longer needed. It obviates the need to reconfigure the device for the next patient, recharge a battery, or perform preventative maintenance/recalibration. Many of the issues related to device sterility are also mitigated. Because the disposable wearable comes directly out of brand-new packaging, it eliminates both the need to sterilize it after patient use as well as any concerns that the device was potentially contaminated before use. Advances in technology, increasing government support and private funding (e.g., venture capital) will contribute to further expansion of the disposable medical sensor market. Factors that will hinder growth of the industry include stringent approval regulations for new products, sketchy reimbursement policies, and long turnaround times. For more research and market forecasts, download the report overview for Disposable Medical Sensors: Technologies and Global Markets (HLC182B).